I've already used it to order multiple pairs of socks. Amazon hasn't dared to make a smartwatch of its own yet, but it might not have to when companies like iMCO have shoehorned Alexa into a wearable themselves. 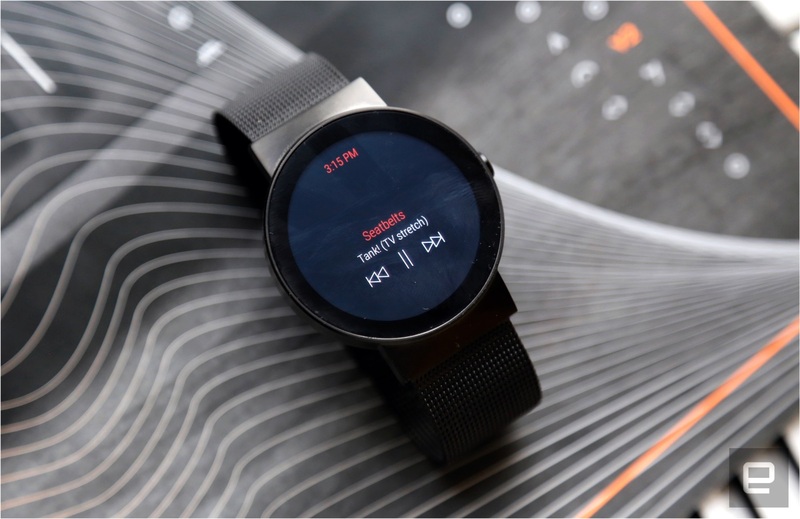 See, iMCO and the ex-Googlers working on the Cronologics OS have successfully turned what could've been another bit of crowdfunded vaporware into an actual product -- the CoWatch -- complete with blessings from Amazon. At last, you'll be able to order multiple pairs of shoes straight from your wrist. Isn't the future grand? The CoWatch goes on sale on Amazon today with prices starting at $279, but I got to put a near-final model through its paces ahead of the company's big day. Spoiler alert: Having Alexa with you everywhere you go can be very cool, but the CoWatch definitely isn't for everyone. In fact, that becomes clear almost right off the bat. 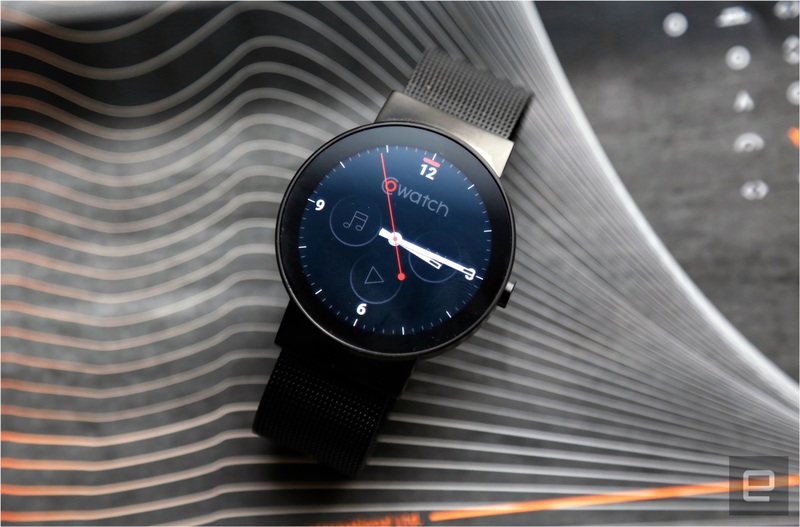 The CoWatch team managed to squeeze a lot into this stainless-steel body: There's an Ingenic dual-core chipset, 1GB of RAM, a screen running at 400 x 400 and 8GB of storage -- the most I've ever seen in a wearable. While the whole thing is lighter than it looks, the watch's thick body and high lug placement make things feel a little cumbersome. Even so, there's enough horsepower here to keep things moving at a pretty reasonable clip; swiping through long notifications and launching apps to monitor your heart rate proved to be no problem for this chipset I've never heard of. The screen's pretty bright too, though there doesn't seem to be a raise-to-wake option; you'll have to hit the crown button to do anything beyond glancing at the time. I need to spend more time with the watch to make any serious judgments, but the hardware seems adequate so far. The software loaded onto the CoWatch holds more promise. Instead of embracing the rigidity of Android Wear, iMCO went with an upstart Android-based OS from an outfit called Cronologics. Navigating it is simple enough: Swiping down on the clock screen reveals your notifications, and swiping up brings up quick actions like toggling airplane mode and a battery meter. There's technically a separate page for your apps, but you're not going to use it much; Cronologics designed the interface so app shortcuts appear as complications on the watch face itself. Easy, no? The Cronologics OS is actually built on top of Android Lollipop, and that's where the extra flexibility comes from. The watch can technically run any Android app, though there doesn't appear to be a way to sideload them. (That's probably for the best, because most Android apps aren't meant to run on screens this small.) It works just fine with both iOS and Android devices too. 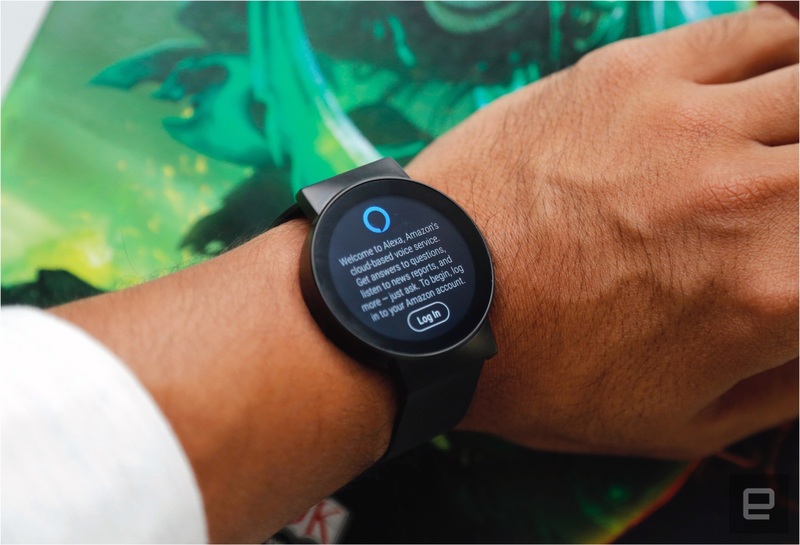 The real magic lies in how the operating system can connect to web-based services like IFTTT for one-touch actions and yes, Amazon's Alexa. Using Alexa on your wrist is about as straightforward as you'd expect -- you invoke her by holding down the crown button or tapping an Alexa complication on the screen. From there, the usual hijinks apply: The watch was able to tell me how old Jeff Bezos is and the distance from the Earth to the moon, and it helped me order some socks too. The process felt far from instantaneous, though. In general, it took a while for the watch to interpret my question, pass it along to the Alexa web service and give me the appropriate response. Setting up the feature can also be a little tricky, because it requires the watch to be tethered to your phone -- a no-go on old, grandfathered unlimited-data plans like the one attached to my iPhone. Once I paired the CoWatch with another Android phone, though, it only took a few moments to get acquainted with Alexa. Not bad, especially since I don't have an Amazon Echo at home. Then again, I'm already well-known among colleagues for having poor impulse control, so the ability to buy just about anything from Amazon without even having to look at a screen seems troubling for my bank account. It appears the age of the always-connected shopping assistant is upon us, though: The Omate Rise is getting Alexa support as well. While we're not ready to deliver a verdict on the CoWatch just yet, the level of promise here is tough to ignore. I could take or leave the hardware, but if Cronologics pushes to get developers onboard and keeps hooking the OS into web services we all use anyway, the CoWatch just might become a contender. Alexa is just the tip of the iceberg, friends -- there's still plenty of smartwatch envelope-pushing to be done.